Are all those NSAID allergies you see on patients’ charts really allergies or could they be side effects? One option not only for the pt with an NSAID allergy, but for the pt with an allergy list that goes on for pages, is to try a test dose of a medication. Not a systemic full dose IV piggy back, but a 0.2 ml intradermal dose (much like the PPD for TB testing). After giving this dose, wait and watch for 10 min, if there is no expanding erythema or other signs of allergic reaction, it may be okay to proceed with a full dose. Preferable in pts with allergic reaction that does not include true anaphylaxis. Hi Andrew. Thanks for your comment. As you mentioned, these patients are particularly challenging when assessing all of the allergies. Are they just intolerances or are they true anaphylaxis-provoking reactions? We have a similar protocol to what you describe for penicillin-related allergies like cephalosporin. A test dose of 10% is given over 5 minutes. If the patient tolerates it after 30 minutes, we give the full dose. I haven't seen too many protocols specific for NSAIDS, but it's definitely worth exploring with your allergy folks to see if you can create one. 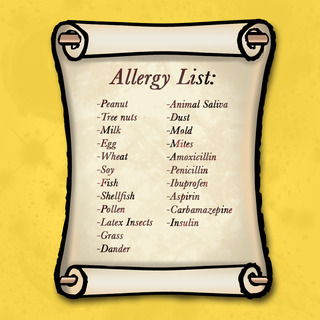 The good news is that true life-threatening allergies to NSAIDS are relatively rare. Bryan, for this topic, are you counting aspirin as an NSAID? Both are COX inhibitors, but If a patient is allergic to one, are you withholding the other? James, great question. We didn't specifically talk about aspirin in this segment. The true IgE-mediated reactions to NSAIDS tend to be to a single agent. Structurally similar ones could trigger the same reaction. Aspirin is structurally different from the traditional NSAIDs. So, patients are likely able to tolerate aspirin even if they've had an intolerance to an NSAID in the past. True anaphylaxis to an NSAID should probably trigger a more thorough investigation with allergy testing before prescribing aspirin, even though the 'cross-reactivity' risk is low.